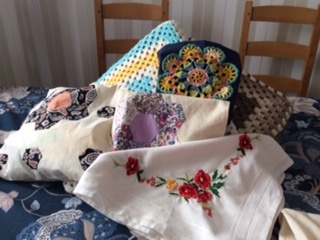 This second Craft Group will meet on the afternoon of the second Monday each month at the home of Rosemary Jenkins at 11 The Ridings in Brixworth. Each session will start at 1.30 and finish at 3.30. At Craft Group Two, we have been working on a range of shared projects, where we pool our knowledge and develop new skills. Recent projects have included crotchet and patchwork. The group first met in March 2017, and now comprises six members. One of our first projects was to make a 'Welcome' sign for Brixworth & District U3A. After operating for a few months we changed our start and finish times from 2 until 4, to the new times detailed above. All members are happy with this, since it is more convenient for those members who do 'school runs'. In addition to the aforementioned 'Welcome' sign, each member has undertaken individual work, such as knitting, crochet and embroidery. Out of the £25 start-up fee, we have purchased wool, needles, and books to help with the work. In summary, the group is doing very well and is looking forward to 2018.